Collins Booksellers - Masterful Medicine by Paula S. Bauer, MD; Mark C. Horattas, MD; George L. Litman & others, 9781634136488. Buy this book online. Masterful medicine is the pursuit of perfection. Perfection may be unattainable, but the relentless pursuit of perfection is available to all who have courage, determination and perseverance. Masters of any endeavor learn with practice to be the very best. They learn with equal measure from their successes, challenges, and even failures. Masterful Medicine will inspire physicians to achieve a masterful practice of medicine, and to live a masterful life. “Masterful” denotes the pinnacle of skills, applied to achieve exceptional results. Masterful physicians are not born with the skills and knowledge that make them exceptional. Physicians become masterful with experience and the accumulation of wisdom. Masterful medicine is practiced by physicians who possess the values and attributes that drive them to relentlessly pursue perfection. Physicians who possess these values and attributes practice masterful medicine, that drive to pursue perfection. 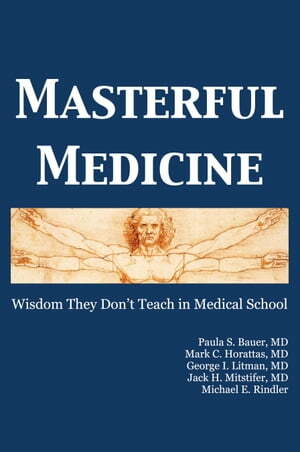 This book describes the values and attributes that give meaning to masterful medicine. Masterful medicine thrives in very diverse settings. It thrives in eminent urban clinics and hospitals, in suburbs, and rural clinics. It thrives in Third World countries and backwater locations throughout the world. It also thrives in medical schools and residency programs where future physicians are formed. How is this possible? Masterful medicine is not about location, affluence, or technology. Masterful medicine is about the values and attributes that drive physicians to pursue perfection, no matter what setting they practice in. Masterful medicine is personal. It is about humanity, not technology. A physician can practice masterful medicine without technology, but not without humanity. These things are not taught in medical school. This book is a framework for the timeless skills, values, and attributes of masterful medicine. All of these skills, values, and attributes can be learned and embellished.